The 25th of March is certainly marked red in calenders of many reading enthusiasts because today is “Tolkien Reading Day”. The celebration of the works and fantastic worlds of the British author J.R.R. Tolkien has taken place since 2003. The date is not chosen randomly as the 25th of March marks the fall of the Dark Lord Sauron in Tolkien’s “The Lord of the Rings”-Trilogy. For patrons of the tub. it is therefore recommended to take a glimpse in „A companion to J.R.R. Tolkien“ (available within TUHH intranet). Among other things the scientific work provides an insight into the life of Tolkien as well as defining topics in his works. Anyone who has always wanted to know more about unpublished stories, poems, maps or notes about Middle-earth should also take a look. Patrons of the library can also view further scholarly engagement with Tolkien’s work in the Journal of Tolkien Research. 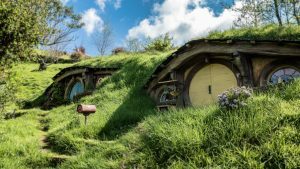 Here you can learn more about the flora of Middle-earth or the general representation of nature in Tolkien’s works. We hope you enjoy browsing, reading and marveling.